Children like birthdays and baseball games. They like going to camp and collecting gedolim cards. And they like, they really like, stories. 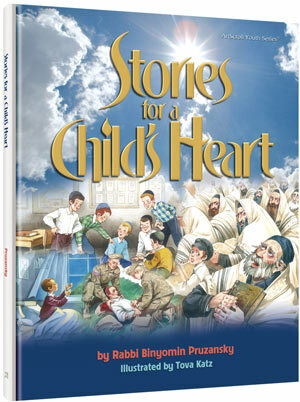 Rabbi Binyomin Pruzansky has touched thousands of readers with his bestselling “Stories for the Jewish Heart” series. Now, in this endearing, beautifully written book, he shares his wonderful storytelling talents with our children. The stories in this marvelous collection have been carefully selected to appeal to young people’s interests. There’s the big game of the season, in which a camper must choose between batting the winning run – or doing the right thing. Readers will meet two American soldiers who save a young man from a terrible accident and then mysteriously disappear, and a gadol b’Torah who shares his yarmulke with a confused Russian boy and changes his life forever. Card collections and classrooms, “pickpockets” who give money away, and a lesson in compassion taught by the Bobover Rebbe zt’l – the stories are engaging, unforgettable, and absolutely true. Delightfully illustrated by Tova Katz, Stories for the Child’s Heart will entertain, educate and inspire our children – and, surely, touch their hearts.